StockMaster Mezzalift requires permanent fixing at ground level and also at the upper floor level. The points of attachment to any structure being part of a building must comply with relevant building codes. Any independent structure such as a free standing mezzanine must be capable of withstanding a horizontally applied force of 120 kg in any direction at the point of attachment. StockMaster Mezzalift adapts to any floor height within a given range by adjustment to mast length. This is provided by an indexing mechanism at base of the product. 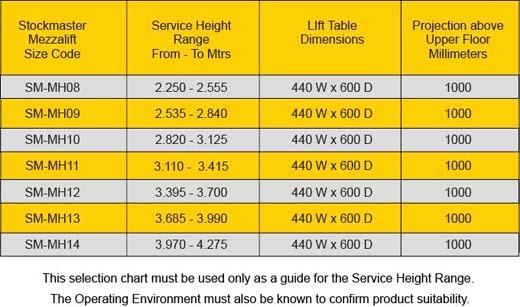 The product must be selected and height adjusted so that the lift table when positioned at the maximum lift height will be equal to or slightly higher than the perimeter railing at the upper floor. The operating space at the upper floor must be sufficient to enable loading of goods to a safe location and not abutting the perimeter railing. Overhead clearance must be sufficient to allow the operator adopt a normal standing position without crouching. Moderate to light frequency transfer of goods to mezzanine floors and other work and storage areas. Mezzalift is ideal for this application as it offers a cost effective solution and safe solution for moderate frequency goods transfer typically for items that are infrequently accessed. For safe working items should not exceed 20 kg. maximum with the maximum total load being 60 kg. StockMaster Mezzalift Size Selection Chart.